My client’s mare is lovely; a very well-bred athletic horse. When my client bought her, the previous owner suggested my client get a cowboy to ride her at first, she needed spurs all the time and the horse was ‘mare-y‘, whatever that means. I get a little mare-y myself at the suggestions. My client decided the best course of action was working on the fundamentals. That’s where I came in. My initial feeling was that the young mare was pushed hard and fast. She needed some decompress time and although she looked for the familiar spur pain, we took a slow approach to give her time to notice the fighting had stopped. The mare was absolutely terrified of plastic bags and oddly, because it was an out-of-context fear compared to her wonderful, smart personality in general. She was not at all spooky. One day my client sent me to the breeder’s website and I watched several videos of them with young horses. In each video, the humans were aggressively stepping forward, viciously flapping bags at the weanling’s eyes. I got squinty just watching. The young horses were confused more than obedient, and some were truly frightened. The breeders seemed to have no awareness of the response, never gave a release, and of course, there was no reward. It’s just bad horsemanship. In a way, these sale videos showed fearful rescue horses. Worst of all, I saw what my client saw. The impact of this early work had infected the whole training process. Was this where her defensiveness began? Sure looked like it to me. It’s a long quote, but I don’t think I can say it better. Most of us have seen the same thing. When we don’t get the response we want, rather than checking fundamentals and tuning up the rider’s ask and the horse’s response, we ‘get a bigger gun’: More whip, spurs, a stronger bit. If a little is good, more is better. This is not just a bad idea, it is wrong. Oh, yeah, the horse. Maybe he is over-reacting or maybe he is shut down, but in either case you are just now noticing that his answer. There has been so much focus on using the aid, there was no listening to the horse. People love to complain that with the internet and smartphones people aren’t spending enough literal face time with family and friends. I feel that exact way about training aids. An inanimate training aid never replace an actual conversation where both sides try to understand each other. If your aid isn’t working and you think you need something stronger, try less. When your horse doesn’t understand, yelling the same thing louder isn’t the solution. Find a way to communicate clearer, use rewards to let the horse know they are getting warmer, closer to the right answer. Remember riding is an art, you need creativity. Lighten up, physically and mentally! No joke, whisper the cue. Use a calf instead of a spur, or release the reins and ask. Use more brain and less brawn. “Every aid can achieve the exact opposite of its intended effect through exaggeration and poor timing. The continual rein aid lets the horse get stuck and resistant. The poorly timed or rough driving calf can bring disorder into the legs, the gait. The seat that drives too long and too intensively makes the horse roll away on the forehand.” – Gustav von Dreyhausen, mid-1800′s. 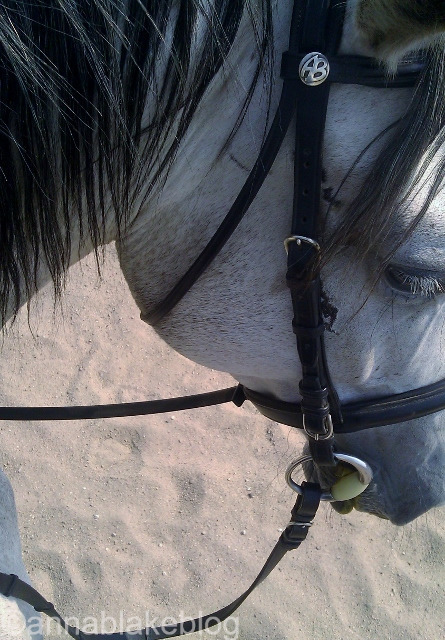 Less is More: It’s the one thing horses are forever trying to train us, the one thing that we just don’t trust. Flies have this down, but humans, not so much. First of all, I cannot agree more with this Article. I ride at this farm and there is a bit of drama between myself and the other girls who ride there & go to my school, but it is all about how she treats her horses. I will not give out any names but it is 1 12-year old, and another about 10-11 year old, who both own horses. The younger one, left her horse to pasture for 2 years, then decided to get right back into the show season. She was doing one of them western sports, and her horse bucked her off, so he sold him, just like that. I told her over and over that the horse was just confused, and she needed to pretty much go back to square one and give her horse a chance to first of all get back into being ridden, and to have a chance to remember the cues. Then the 2nd girl, she was in western pleasure with spurs, and her horse came out of the ring bleeding in the barrel, and on his nose, he had stumbled when cantering and his nose was so close to the ground he banged it. that 2nd horse got sold, and I rode her for 3 years, (she has now been sold again to a new owner) but she would freak if she even saw a pair of spurs on the ground, or on another rider, or anywhere. I cannot explain how much both of those girls need to read that article. My experience training up the levels was that my cues got smaller, and when I look at the world leader right now, Du Jardin, her cues are nearly invisible. Don't let the rollkur monsters spoil it for the rest of us. A few years back I sat and watched Steffen Peters for 8 hours with a whole range of horses and thought he was the lost Dorrance brother. One big reason, in my opinion, that the aids become abusive at the higher levels of riding, is the modern fetish of absolute precision in modern competition dressage. Not only does the horse have to do the movement, the horse HAS TO start and end the movement at a specific location in the ring. Often faulty movement that starts and ends in the "correct" spot in the ring gets higher marks than a fluid collected movement that misses the "correct" spots. Another problem I see is that correct dressage gymnastics can (and should) lead seamlessly to the "airs above the ground." This can be distressing for the unprepared rider. I do not think that the dressage instructors for competition dressage like these movements either since they do not add to a winning dressage score. Therefore any sign of elevation from the horse is BLOCKED severely, often leading to horses behind the bit and on their forehands. Unfortunately once you block an air above the ground you have to keep that block going or when you finally "let go" the horse may proceed with the air above the ground in a much more vigorous action than if the horse had not been blocked. I thoroughly enjoyed your post. I especially liked the quote on the end. Marla Thomas, I thought I saw a comment from you and now it's gone??? Sorry. Darla, I agree. I see it so often in lessons and competition. Sometimes we don't give the horse time to respond to the aid, ask, ALLOW time for response, reward for the slightest response and pretty soon it becomes automatic. Well written and a great message! I sometimes encounter students who think they need a stronger aid or a harsher tool because they aren't currently getting results and possibly even another coach told them to get tougher. It doesn't occur to them that maybe they need to lighten up instead. When things aren't working often you need to tone it down and bring it down a notch to find out what is REALLY going on. The other day I had a student ask "Should I start using a stronger bit?" I said, "Let's lose the bit for awhile. She seems to be running through the aids with her anxiety." We switched to a side pull and the mare calmed right down and we could focus on some lacking fundamentals without the distraction of aids that were clearly to loud for this sensitive mare. We will add the bit back in when the basics and relaxation are in place. (note: this horse has had her teeth done and been looked at by a vet). She's like a new horse after a few training sessions. A harsher bit would have only exacerbated the anxiety of this particular mare and it would have done nothing to help her young rider learn how to use signals better. I love your "Less is More."